MacBracey bought the historic Clarke House building in May of 2017. 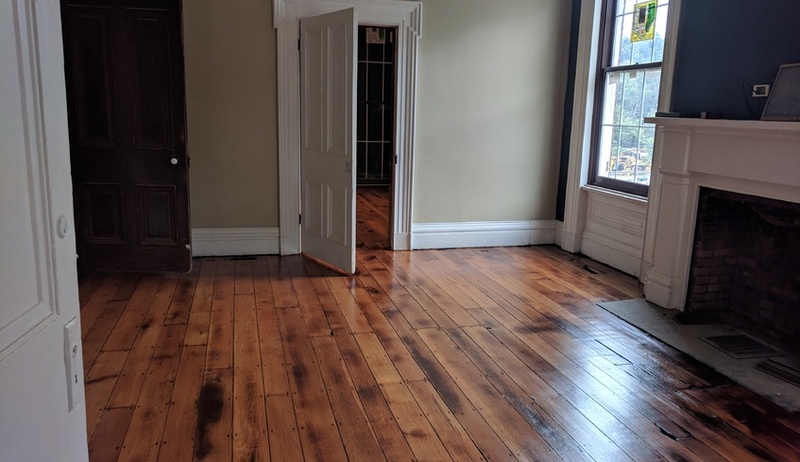 When we bought the property there was a lot of work to be done to convert the 1850's home into a office space with all commodities required of a modern office. We began the work immediately but ran into a landmine of unforeseen issues. We decided to clean the paint off the exterior of the building and found that the mortar joints would vanish when cleaned with a brush and pressure washer, this required us to re-point the brick exterior. This includes 3 chimneys that serve the 12 interior fireplaces. The roof had some leaks, so we installed a new roof on both parts of the building. When ripping off the existing shingles we discovered the decking was failing, we then installed new plywood decking on the entire roof. A lot of the box gutters had rotted wood and leaking flashing that required them to be rebuilt, re-flashed, and repainted. The custom trim above and below a lot of the windows on the main house had failed so we had a friend and great wood worker, Mel Gleason, make the pieces and we installed them. This really dressed up the building and we could start to see the old house come back to life. We refurbished and rebuilt shutters for the main house. Although we had a lot of the original shutters only a few could be saved as they were rotting away. The large shutters on the front porch were mounted and still function as originally intended but the others are just fastened to the brick wall for looks. A lot of the buildings exterior trim finishes; rake trims, window trims, and fascia, were rotting out or missing. We scraped, repaired, and painted what was salvageable. The wood that was damaged beyond repair was replaced, this required wood shops to match the custom profiles on the building from the 1850's. The side porch was an interesting repair. We had decided to remove the deck boards and replace the damaged joists, once the deck boards were removed we had discovered a 25' well was under the porch. We filled the well with stone to secure the area and protect everyone from the fall hazard and then began rebuilding the floor of the porch. The front porch is one if the last items that needs repaired. Once the winter breaks we plan on pulling the deck boards, fixing any structural issues, and painting everything to match. We think that once this is complete the exterior will be just about brought back to its original condition. For the interior we tried to keep the building as close to the original appearance as possible. This was very trying and at times it seemed impossible! We continued on course and we are very happy with what we have now. We replaced the plumbing lines in the house with new PVC and pex lines. We hope this will prevent any issues in the future as the entire system is new. We installed a new electrical service and wiring throughout. The old wiring was certainly not up to code and we know that having a new office space would require a new system. With the electrical came the data lines which we added throughout the building. We even have a server room which has our new server and all the data racks. We installed 2 new furnaces for the main house. The first of the furnaces is in the basement and services the first floor of the main office only. The second furnace is in the third floor and services the second floor only. The addition to the rear of the building is serviced by all mini-split heads, there are 4 in total. We have replaced all the windows with units that match the original appearances as much as possible. This was tough because several of the windows are 10' tall! The new windows are great and let in so much natural light! They are one of our favorite parts of the building! We have replaced, repaired, or retrofitted all doors in the house. We found antique hardware store that sells replica antique hardware and all of the interior doors are outfitted with the antique hardware. The doors needed a lot of work to shut and seal correctly but this was a serious issue to keep the HVAC costs low. All of the walls were re-plastered and painted. We chose colors that we were common with the original era. All of the interior trims were either refinished or repainted, depending on there existing condition. This gave life to the inside again and we could begin to see what was here 160 years ago. The final step before moving in was refinishing the wood floors. This was an amazing transformation and made the biggest difference. The floors are either pine or oak depending on the room, the stair case is pine and has a black walnut handrail. This was truly a masterpiece when originally built. The community has been so supportive throughout the renovation project. They have stopped by and told us their stories of the building and all their memories. It has been a very rewarding project. We are going to have a open house for everyone in the community to come check out the house if they want to. We hope everyone takes advantage and comes in to check it out!